No breakaway attempts before the first climb of the day, the Côte de Gattières, but in this climb we saw several riders try to get away. Thomas de Gendt (Lotto Soudal) managed to do so in the last part of the climb, looking for precious points for the King of the Mountains classification. 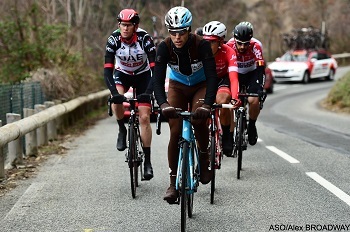 Following this accelleration, the first real breakaway group was formed, in which the Belgian rider got company from Rory Sutherland (UAE Team Emirates), Tony Gallopin (AG2R La Mondiale), Alessandro de Marchi and Nicolas Roche (BMC Racing Team), Jarlinson Pantano (Trek-Segafredo), Amaël Moinard (Fortuneo-Samsic) and Jesus Herrada (Cofidis). This group manages, despite the hard work of the Astana team leading the peloton, to create a gap of up to 3'20" in the Côte de la Sainte-Baume and that's where De Gendt again takes the points on top, where the gap was already way down, to 2'35". In the Côte de Villars-sur-Var the gap continues to disappear and on top where De Gendt again took 7 additional points it is down to only 1'10". 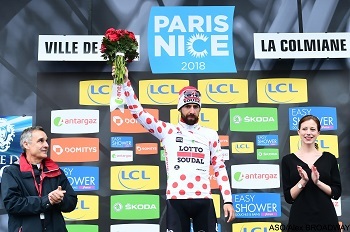 With all the points he collected, De Gendt is than sure to wear the polka dot jersey of the King of the Mountains classiciation and dropped back down to the peloton. The breakaway lost other elements and when it starts the final climb towards La Colmiane, we only have Gallopin, Roche and Moinard left, with only 30 seconds gap on the peloton. In this climb, Moinard is the first to lose contact and finally we only have Tony Gallopin solo ahead. At 13 kilometers from the finish his adventure however also comes to an end. After that, a real selection takes place in the group of favourites all along the climb, until Simon Yates (Mitchelton-Scott) attacks at 4.5 kilometers from the finish. 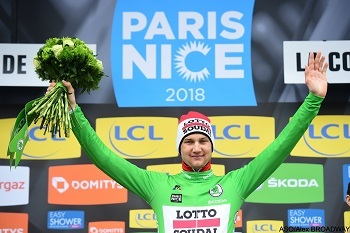 Ion Izagirre (Bahrain-Merida) is the only one to follow him at first, but Yates also drops him and ends of the climb solo, with the stage victory in the end .. as well as the yellow jersey with the white band of the general classification! 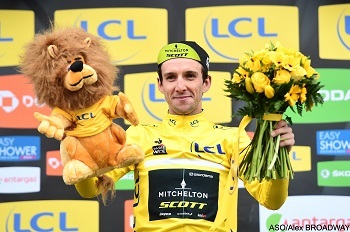 1/ Simon Yates (Mitchelton-Scott) - 5h02'54"
2/ Dylan Teuns (BMC Racing Team) - +0'08"
4/ Gorka Izagirre (Bahrain-Merida) - +0'13"
1/ Simon Yates (Mitchelton-Scott) - 27h29'02"
2/ Ion Izaguirre (Bahrain-Merida) - +0'11"
3/ Gorka Izaguirre (Bahrain-Merida) - +0'12"
4/ Tim Wellens (Lotto Soudal) - +0'13"
5/ Dylan Teuns (BMC Racing Team) - +0'27"
The eighth and last stage tomorrow will start and finish in Nice. In its only 110 kilometers which total this stage, the riders will find no less than 6 climbs.